The much anticipated National Assembly elections were held across Pakistan on 25th July 2018 and as expected the Imran Khan led Pakistan Tehreek-e-Insaf (PTI) party has emerged victorious with the party winning a higher than expected number of seats. Though the entire vote count is not yet complete, the PTI has won 115 of the National Assembly seats so far out of the 272 up for contest amongst the major political parties. A tally of 137 seats is needed to gain a simple majority and the PTI is well placed to form the next government along with the help of smaller political parties and independent candidates to get to the 137 mark which would make Imran Khan the next Prime Minister of Pakistan. This result is a much needed relief for the country and the stock market as it would be a strong coalition government with one party (PTI) having a majority of the seats. Earlier expectations were of the PTI winning anywhere between 85-95 seats which would have meant that it would have most likely needed greater support from potential coalition partners and this would have portrayed the coalition as weak. Therefore the current set up of the PTI having the majority in the coalition it forms will be viewed as effective and be able to have a stronger footing while implementing economic policies. The PTI victory does not come as a surprise given the anti-corruption platform which it has gained on especially over the past year after the ouster of former Prime Minister Nawaz Sharif amid the fallout of the “Panama Papers” scandal which weakened the Pakistan Muslim League (Nawaz) PML (N) in run up to the elections and which is the main opposing party to the PTI. Below we try to answer some of the questions that will be on investors’ minds. Imran Khan is the the former Pakistan Cricket captain who led his team to the country's only Cricket World Cup victory in 1992 even though many experts did not give the team a chance to make it to the finals. 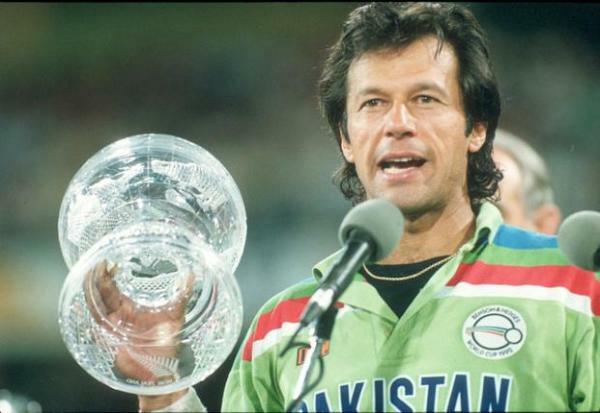 After this win, Imran Khan retired from the game and focussed more on social issues starting initially by helping fund the establishment of Pakistan's first specialised cancer hospital which was set up in Lahore in 1994. Thereafter, in 1996 he formally entered politics by forming the Pakistan Tehreek-e-Insaf (Pakistan Movement for Justice) party with one of its main focus areas being increasing accountability and reducing corruption. This focus has allowed the party to gain a lot of momentum and followers over the past decade especially amongst the younger voters who want change and development. Though there are concerns that he was supported by the "establishment" in the run up to the elections, this victory for Imran Khan is the culmination in a journey of transforming from a flamboyant cricket star used to a privileged lifestyle and being married three times to one of political, social and economic development based on integrity. 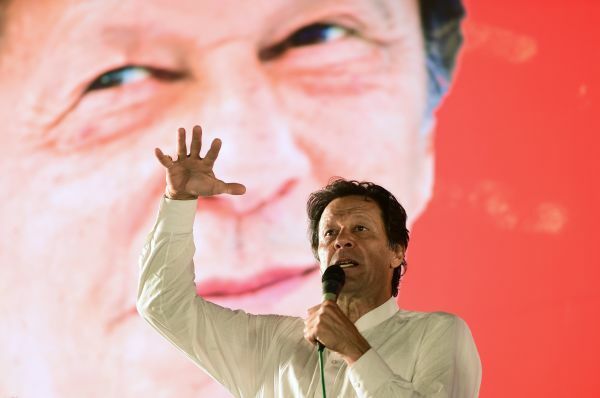 The country will now have high hopes and expectations from Imran Khan similar to when he came out of retirement to win Pakistan the 1992 Cricket World Cup. We hope for a repeat on the political field! What can we expect from the PTI? The PTI has gained strength on an anti-corruption platform given that its leader, Imran Khan has a much cleaner image than the leaders of the other major political parties. Therefore it would not be surprising if the senior leadership of the PTI takes measures to bring in greater accountability within the system as well as take steps to reduce unaccounted wealth. Besides this, the PTI has also focussed on social issues and we could therefore see more thrust towards healthcare, education and low cost housing based initiatives as well as more support for the agricultural sector. From an economic perspective, the PTI will most likely appoint Asad Umar as the next Finance Minister who has a private sector background with his last role being the CEO of conglomerate Engro Corporation. Hence, economic policy making should be stable going forward and we also expect the new government to continue with the execution of the China Pakistan Economic Corridor (CPEC) as this initiative has had all round political support from its very start. With respect to the current balance of payments issues that the country is facing we expect that the new government would most likely go to the IMF (International Monetary Fund) for a loan programme (more details below). The macro economic situation for the country has deteriorated over the past year as the current account deficit has widened to 5.7% of GDP in the financial year ending June 2018 which has led to a reduction of foreign exchange reserves with import cover of just over 2 months while export growth and foreign remittances have not fully helped plug the gap in the current account as imports have grown at a much faster pace over the past 12-18 months. The reason for the increase in imports is two-fold. The execution of the CPEC projects, most of which are power projects, has led to a surge in machinery imports while the higher oil prices over the past year have also pressured the current account as Pakistan is a net energy importer. Though the current account deficit has widened, we would like to add that the CPEC based power projects will be important to overcome the power deficit in the country and help improve productivity as the lack of power has been cutting 1-2% from Pakistan’s GDP growth rate. Since 2018 was also an election year the outgoing government loosened its fiscal stance towards higher expenditure in order to satisfy various voter bases and this has led to a higher than expected fiscal deficit. Given the situation that the new government will find itself in, it is widely expected to request the IMF for a loan programme and this amount could be in the range of USD 10 billion due to the upcoming financing needs of the country. 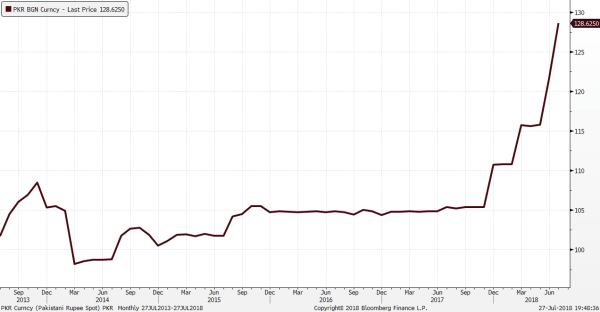 The growing current account deficit and declining foreign exchange reserves have already led to a greater than 20% depreciation of the Pakistani Rupee (PKR) since December 2017 while the Central Bank has raised benchmark interest rates by 175 basis points so far this year. 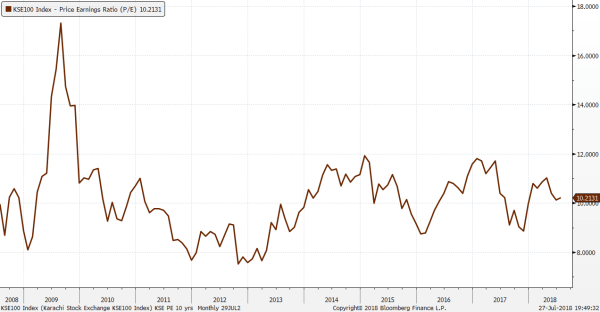 In all likelihood we will see interest rates rise further this year as the Central Bank tries to contain the impact of higher commodity prices on inflation as well as rein in demand while some more weakness can be seen in the PKR in order to reduce the pressure on the current account. If the IMF loan program goes through, it would most likely require the new government to implement reforms linked to reduction of subsidies, reform of the power sector, increase in the tax base, privatisation of state owned entities and reduction in government expenditure. All in all, with constraints on further government spending, higher interest rates as well as a weaker PKR, final demand is expected to soften going forward leading to a slowdown in GDP growth. What is the impact on the stock market and what are our views on Pakistan going forward? Both, the political and economic uncertainties over the past year have already had a negative impact on markets as well as valuations. The KSE-100 Index has lost 31% in USD terms from its high in May 2017 while the trailing 12 month P/E of the index at 10.2x is now at a large discount to most markets in the region. It appears the worst of the political and economic issues have been priced in and from a political perspective we should have a stable government while from an economic standpoint there will be more to be done to stabilise the current economy and until we have policy measures such as an IMF program in place, economic uncertainty may continue. Further, as mentioned above, economic growth would possibly slow down due to higher interest rates, a weaker PKR and measures put in place by the IMF to cut government spending. Overall, given these issues above, we think most negatives have been factored into valuations but with growth expected to slow down in FY 2019 there may not be any major trigger which can lead to a significant rally in the stock market. Hence, since we have already reduced the fund’s exposure to Pakistan over the past six months, going forward we expect to maintain our current exposure and look for bottom up opportunities as valuations appear attractive in sectors such as banking, cement, and oil & gas. You can view our Senior Investment Analyst Ruchir Desai’s views which appeared on Bloomberg on 25th July 2018 here. We hope you find this ad-hoc information useful, please feel free to contact us for any questions.